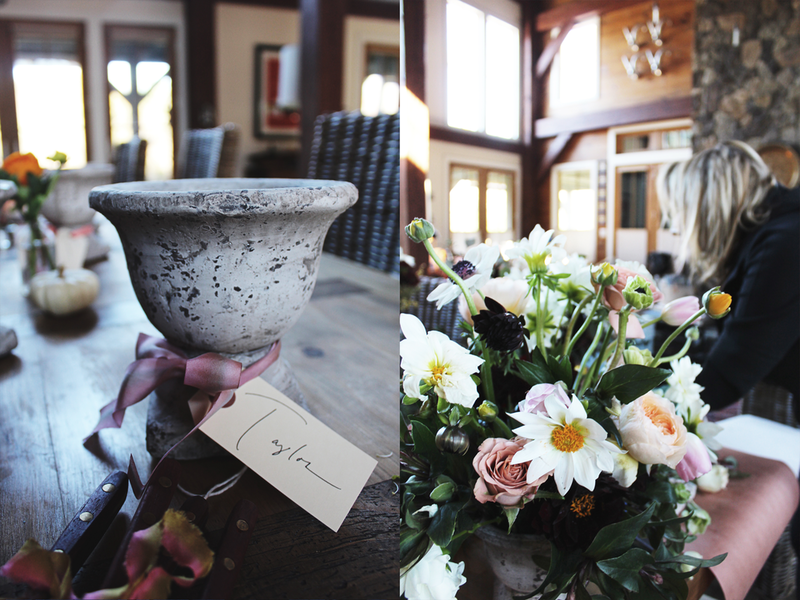 Last month LJ hosted our very first retreat in the ever desirable Hudson River Valley. We dreamt up a retreat when we realized colleagues in the food, design, and floral markets had started serving the insatiable desire for creatives to gather, literally all over the world. We wanted to create a little event that reflected these things, ourselves. For most of us, the reality of “making it” in NYC means sacrificing some—if not all—of the time you might devote to quieter creative impulses. Sometimes the cost of having a family and/or keeping one’s professional “edge” means letting go of time spent reveling in beautiful, whimsical experiences—when push comes to shove, they start to seem indulgent. We wanted to create a space where ladies could gather around a meal, a whimsy workshop, and a beautiful setting to be nourished. Our time away at Barn on the Pond turned out to be rejuvenating (and surprisingly hysterical what with all of the crazy stories that were told 'round the crafting/dinner table), leaving our participants inspired. Welcome to Little Joy! Follow us (NIA, KATY, & MEL) as we adventure from Brooklyn to Manhattan in our various elements. Nia is a graphic artist, Katy nourishes us all, and Mel sets the table. Read along as we share our adventures in sharing Little Joy in all we do. Little Joy hopes to share our overlapping appreciations/affections that comes from the beauty found in the ordinary and mundane. Together we value the depth of feeling that comes from the experience of sharing a meal, table-setting, or appreciating design. We're interested in what is temporal, yet nourishes you in a way that ultimately sustains you well beyond the moment. Follow along as we pioneer new territory, the blogosphere, in attempt to sprinkle a little joy in the lives of all our unique visitors who happen upon our offerings. PS. Here is a little taste of our next blog post...a feature on our recent women's retreat at Barn on the Pond along the Hudson River Valley in November! We are well into Halloween and if you know anything about New Yorkers, you know they take Halloween seriously. The Rev. and I are cooking up a fun couples costumes, stay tuned…. In addition to trick or treating and running around town, we are hosting a Halloween Farewell supper. When you live in NYC there are MANY farewells to be had. People transfer jobs, return to home towns, you name it people move. Tonight is very special since we have a dear parishioner who is headed south and it wouldn't be proper to say goodbye without having supper one last time. Many table scaping is in the works. I was going for a soft autumn look that also paid a nod to Halloween. Here is what we have so far…..